The arrival of “the abstinence of meat”, or in other words Carnival, does not go unnoticed in Los Realejos. This event has been celebrated in the area for many years, although perhaps with more energy since the 1980s which is when Carnival began to be celebrated in the same way it is celebrated today. From that moment organised groups began to appear, such as the carnival choir troupes (murgas) and dancing troupes (comparsas), that add their own particular sparkle to the events. 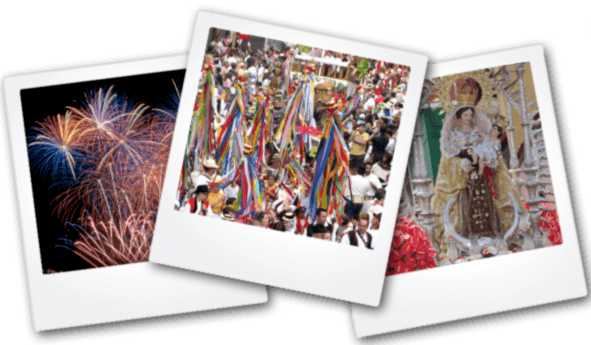 Different events and parades take place, including the carnival processions, shows, and antique car parades, as well as the selection of the Queen of Carnival. All of this comes to a close with the burial of Mr Rascayú, a well-known figure who embodies the celebrations. Over the course of these days, the explosion of light, colour and fantasy that is Carnival radically transforms the surrounding streets and the nightlife is electric as local residents show off their creative costumes.